Members of the Security Council at the vote on a resolution on the mandate of the UN Supervision Mission in Syria. The Security Council today renewed the mandate of United Nations observers tasked with monitoring the cessation of violence in Syria and the full implementation of the international peace plan put forward to end the ongoing crisis. The Council established UNSMIS in April with an initial 90-day mandate, which expired today. 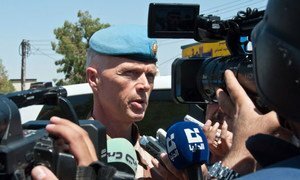 The Mission had recently suspended its regular patrols due to the escalating violence in the country, where over 10,000 people, mostly civilians, have been killed and tens of thousands displaced since the uprising against President Bashar al-Assad began some 16 months ago. UNSMIS was tasked with monitoring the cessation of violence in Syria, as well as monitoring and supporting the full implementation of the six-point peace plan put forward by the Joint Special Envoy for the UN and the League of Arab States for the Syrian Crisis, Kofi Annan. That plan calls for an end to violence, access for humanitarian agencies to provide relief to those in need, the release of detainees, the start of inclusive political dialogue, and unrestricted access to the country for the international media. Speaking to reporters in Ljubljana, Slovenia, Mr. Ban said that he and the Joint Special Envoy would press ahead to try and end the violence and abuses in Syria. “We cannot abandon our collective responsibility to enable a peaceful, democratic, Syrian-led transition that meets the legitimate aspirations of the Syrian people,” he said. The UN chief called again on all the parties, starting with the Syrian Government and opposition forces, to stop the killing, and especially the use of heavy weapons against the civilian population. With fighting now taking place in many parts of Syria, the UN High Commissioner for Human Rights, Navi Pillay, strongly urged all sides to make a huge effort to ensure civilians are not killed or injured. “Conflict in urban areas is obviously especially dangerous to civilians. And far too many innocent men, women and children have already been killed and injured already, as well as a million displaced,” her spokesperson, Rupert Colville, told reporters in Geneva today. The UN High Commissioner for Refugees, António Guterres, has also expressed his growing concern for the dramatic numbers of people who are fleeing their homes in Syria. “With the spread of deadly violence, I am gravely concerned for the thousands of Syrian civilians and refugees who have been forced to flee their homes,” he stated. Thousands of Syrians crossed into Lebanon yesterday, the spokesperson for the Office of the UN High Commissioner for Refugees (UNHCR), Melissa Fleming, told a news conference in Geneva, adding that there are various reports claiming that between 8,500 and 30,000 people having crossed in the past 48 hours. In consultation with government authorities, UNHCR and partners are now in the field verifying numbers and assessing the profile and needs of newly arrived Syrians, with a particular focus on vulnerable people who may need immediate assistance. According to the agency’s registration statistics on 18 July, 120,000 Syrian refugees sought protection in Jordan, Lebanon, Iraq and Turkey. According to Government estimates, the numbers are much higher, noted Ms. Fleming. United Nations observers who entered the Syrian village of Tremseh on Saturday confirmed that an attack took place there two days ago, involving the use of artillery, mortars and small arms.